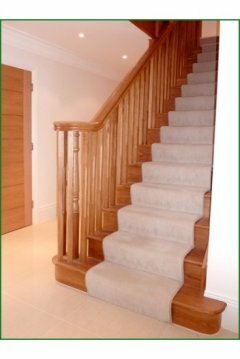 As one of the most highly regarded manufacturers of stair parts in Kent and throughout the UK, Pear Stairs is on hand to assist with your staircase building and renovation projects. Whether you need hand rails, spindles, newel posts or any other imaginable part for your staircase, we will meet your needs and treat you to excellent customer service along the way. Kent is home to a town named for a staircase that was cut into a cliff face, to allow access to a shrine from the bay below. While the steps at Broadstairs differ from those traditionally found on domestic properties, Pear Stairs produces stair parts for external staircases in addition to those intended for use within the home. 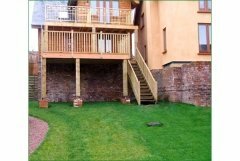 We have been involved with a number of outdoor projects, working closely with the customer on each occasion to closely match their specifications, and ensure their needs are met. We are particularly well known for the speed at which we are able to produce high quality stair parts to match our Kent customers' designs. Our work in the Kent area has left customers impressed with delivery times, and joiners delighted with the standard to which our products are machined. Using hardwoods, softwoods, steel and glass, we can create traditional or contemporary designs, and that process is guided by you. Whatever plans you have for your staircase, we are eager to listen, and to work with you to develop and refine your designs and ensure that they are a perfect fit for your home. A staircase from Kent also inspired novelist John Buchanan to title his famous book, The Thirty Nine Steps, and by browsing through the selection of stair parts on our website, you too can create inspirational designs influenced by literature, or indeed born of your own imagination, that could put your home on the map. Take a look at the great selection of Kent stair parts available in our on-line shop or contact us if you require any further information.